This huge expanse of a beach is set next to the rolling mountains of St. Thomas, and what makes this SO beautiful is that the mountains literally roll right down into the Caribbean Sea. 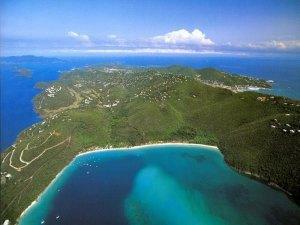 The water around this enchanted Island is so blue, and I’m happy that pictures of St. Thomas normally pick up the hues. It is even more breathtaking in person. Have you been? What did you think? Care to comment below and let us know. We’d be happy to post any pictures you have as well. Conde Nast Traveler gave this beach a rating of one of the world’s 10 most beautiful beaches. What makes it so is that it spans between two mountains. It’s accessible – only three miles north of the capital. Yes, the turquoise waters are heavenly and perfect for snorkeling or swimming. 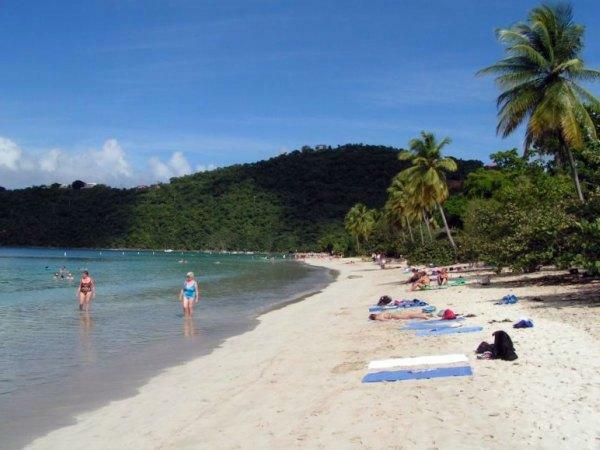 But remember, St. Thomas is a great port for cruise ships so you’ll often find Magens Bay Beach very crowded. Choose mid-afternoon as your time to visit. They have everything here, from snorkel rental to changing facilities. Kayaks are available as well. However, there is no bus service out to Magens Bay. Some hotels run shuttles; check with yours. Magens Bay Beach is gated. The gates are open from 5 AM to 6 PM and by late afternoon you’ll need insect repellent. It costs $3.00 to get into the beach and ample parking is available. Sand – powdery white, coral substance. Shade – palms and some umbrellas. Sports – all available. Check local vendors. This site is a great resource for beach information! We were in Magens Bay in Dec 2009 (http://tiny.cc/w2uC9). Completely agree that Magens Bay can become quite crowded…still it's a nice beach! Only wish it had been sunnier (and not sprinkling) when we were there.